What’s the “Big Dill” About the LA Fermentation Festival? Join me July 12th at the Los Angeles Fermentation Festival for a delicious day of pickles & fermented delights! Use my code BEAN to save $5 on your ticket! In fact, I love all things pickled. I had found that Spreewald was known for producing their famous gherkins, and decided right then and there I had to make the short trek from Berlin to stuff my face with as many salty, crispy, German delights as I could handle. I dreamt of the pickled goodness for days, counting down the moment I’d hop on a train and arrive in the City O’ Pickles. I started visualizing objects in my eyesight as pickles. My currywurst and Döner Kebabs took on the shapes of the mighty gherkin (Editor’s Note: The Roaming Bean is not in any way shape or form disrespecting the holiness that is one of the greatest food items ever contributed to the human race, AKA the kebab.). I mentioned repeatedly to my friend how badly I wanted to visit GherkinLand. At first, he was in agreement that it sounded fabulous, but in the end, he would not go with me. Instead of traveling to what could have possibly been the Mecca of Pickles, I stayed in Berlin and drowned my sorrows in a few lengthy, harsh pub crawls that left my head pounding for days. I ended up kicking myself in the rear for the next couple months, as I continued traveling through one country to the next, regretting the absence of my much-anticipated sodium-induced pickled food coma. In all actuality, I’ve never gotten over the fact that I missed Pickle World, and I’ve lost many nights of sleep over it. Luckily, the inaugural Los Angeles Fermented Food Festival is kicking off this weekend in Venice, CA on July 12th! Aside from a promising collection of fermented goodies from kombucha, kimchi, sourdough bread and booze, is of course the presence of the mighty pickle, complete with a DIY pickle bar AND pickle contest. It’s as if the heavens have opened and poured a sea of pickles into my world, and I can’t wait to eat them. Lots of them. All of them. There will be hands-on learning experiences and lectures, too, so if you’ve laid in bed at night, staring at the dark ceiling dreaming of what foods you could tastily ferment, then this is for you. (And because I can’t be the only on in the world guilty of having thoughts of food disrupt my sleeping patterns.) Use my code BEAN to receive $5 off the purchase of your ticket, which can be done here. The all-age festival runs from 11am-4pm, and the farm-to-bar area, which will be for those 21+, will be available from 12pm-3:30. Kiddos 15 and under are free with an adult. Venice Arts Plaza 681 N. Venice Blvd. Venice, CA 9029. 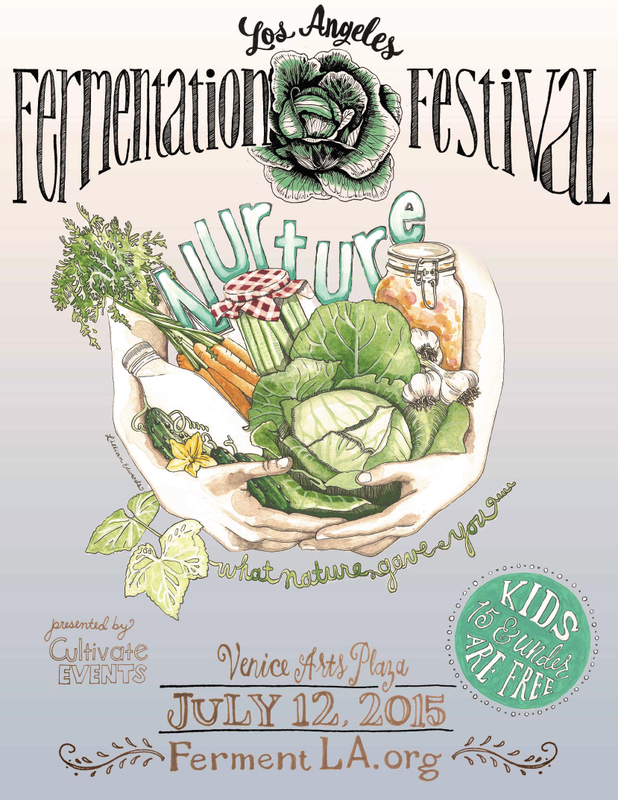 LA Fermentation Festival has graciously invited me to attend this event. All opinions, like always, are my own.